If you’re one of the thousands who’ve descended on Santa Barbara for Fiesta this week, you probably already know – this is a wine lover’s haven. The wines coming out of here are some of the best in all of California. And, between margaritas, the opportunities to savor them abound. Downtown is home to a handful of working wineries, too – small but fully equipped facilities where grapes are crushed, put in barrel and transformed into wine over many months and years. Following are three winery destinations not to miss, which offer the chance not only to sip the afternoon away but to meet the guys who make the wines face to face. These should really be a teaser, though – motivation to discover the vineyards and estates that grow the world class grapes that birth these wines. They’re only about 40 minutes up the coast, over those mountains that cradle this lovely city, in towns with names like Los Olivos, Los Alamos and Santa Ynez. They’re well worth extending your stay here well after Old Spanish Days are over, especially since, with grape harvest already underway, the vines are at their most spectacular now. Or come back. Even after the parades end, the music stops and the mercados close, Santa Barbara – and its wine culture – remains one of the California’s destination gems. You’ll find history here. 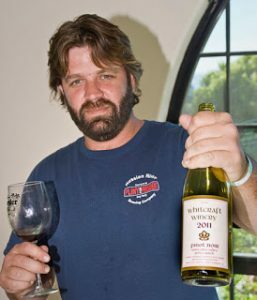 The late Chris Whitcraft could be considered one of the founding fathers of the Santa Barbara wine industry and his son, Drake, continues the tradition today. There’s an obsession here with remaining hands-off and allowing the grapes to show off. No pumping, no fining, no filtering, no enzymes, no watering the wine down. Foot stomping. Gravity racking. Whole cluster fermentation. A lot of fancy terms that, instead of me wasting words defining here, Drake would be happy to showcase for you in person. Bottom line: you’ll find some of the area’s most exciting pinots, chardonnays and syrahs here, along with a bevy of lesser known varieties (ever had gamay?). The tasting room is steps from the ocean. And when you go, say hi to Terra, the winery dog. Whitcraft Winery, 36-A S. Calle Cesar Chavez. 805-730-1680. Whitcraftwinery.com. 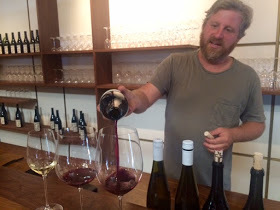 Dave Potter made a name for himself first with Municipal Winemakers, the hip and affordable label that pours inside a converted dive shop in the Funk Zone; the bar here is open late on weekends. With Potek, Potter pays homage to his Romanian great-grandfather, whose name was changed from Potek to Potter when he landed on Ellis Island 100 years ago. The winery is inside a slick new complex called The Mill, near Santa Barbara’s eastside, where Potter cranks out high-end wines from extra special vineyards. 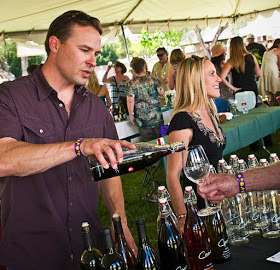 The single-vineyard pinots are awesome, and the Rhone selections – grenache and syrah – are among the area’s very best. Tasting here is a sophisticated yet approachable experience. Take a bottle of Sta. Rita Hills bubbly with you,if it’s not sold out. Potek Winery, 406 Haley Street #1. 805-770-5105. Potek.com. Ryan Carr was managing some of the area’s top vineyards before he turned to making wine, so the guy knows grapes. His wines are consistently good, all made from grapes that Carr grows himself, and crafted with a knack for reflecting a sense of place. The portfolio here is diverse, showcasing the diversity of microclimates in this area that generate a wide range of quality wines, including cabernet franc, pinot noir and grenache. The space itself is cool – a round 1940s quonset hut anchored by a wrap-around bar that’s surrounded by towering barrels. Wine aside, this winery has become a social hot spot, regularly hosting live music events. Carr Winery, 414 N. Salsipuedes St. 805-965-7985. Carrwinery.com. Want more wine, food and travel news? Follow me on Instagram and Twitter!